I was a bit intimidated of working it into my system, since I was knee deep in production. So I started slowly, going through Kyma X Revealed for a few minutes each day. As it turns out, you don’t really have to make complex patches in order to harness Kyma’s amazing processing power. I’ve created foley libraries, morphed dialog, and done tons of real-time sample manipulation by making sounds that only use one or two modules. The key for me is the excellent Kyma Control iPad software. The expressive gestural power of the iPad combined with Kyma fits my approach to sound design like a glove – I can explore to my heart’s content, and when I get a sound dialed in, I just re-record it into Pro Tools against the picture. Can sound define a space? In sound, is there a Point-of-View or culturally-influenced focus of attention? Sound designers, musicians, audio engineers, composers, acousticians and others interested in “sound space” are invited to discuss these and other questions during the third annual Kyma International Sound Symposium (KISS2011), scheduled for 15-18 September 2011 in Porto, Portugal. Inspired by Portugal’s proud history of navigators who set out to explore beyond the known and visible horizon, the theme of this year’s symposium is “Explorando o espaço do som” (“Exploring Sound Space”) and will celebrate the sound designers, composers, and researchers who are exploring beyond the familiar horizons in sound and music. Set in the nautically-inspired Casa Da Musica, architect Rem Koolhaas’ dramatic new music venue in Porto, the symposium promises four intensive days of workshops, keynotes, technical talks, films and live performances. Plus there will be an abundance of technical talks on a wide range of topics including how to use the spectrum of a sound as a sequencer; techniques for data sonification; using sound to help people confront pain; how to create a dynamic sonic ecology; using context-free-grammars to simultaneously generate dance movements and trajectories through abstract timbre space; techniques for spectral modification & morphing; and more. Evening performances are to include a screening of the very first science fiction film accompanied by a live-improvised electronic sound track generated by Kyma reconstructions of Luigi Russolo’s intonorumori instruments; a portion of an audio documentary on Holocaust survivor Ksenija Drobac; and a live-generated audio/video film about Galileo that uses Kyma to control VJ software via Open Sound Control (OSC). Other live musical performances will create sound spaces controlled by (among other things) dancers, RFID cards held by the audience, iPads, Wacom tablets, video position trackers, Continuum fingerboards, SoftStep pedal-boards, OSC, acoustic instruments, the acoustics of the room itself, and even a sensor-enhanced Teddy Bear! For more details on the program, please see the preliminary program and join the mailing list to be kept up to date on future enhancements and additions. Known as A Cidade Invicta (the unvanquished city), in honor of its citizens’ successful resistance of Napoleon’s attempted invasion, Porto’s history can be traced back at least as far as Roman times, with evidence of even earlier habitation by the Celts, Proto-Celts and even Phoenicians. The ukulele has its origins in Portugal; Portuguese immigrants brought the cavaquinho, braguinha and the rajão, small guitar-like instruments with them to Hawaii where they were re-invented as the ukulele. Portuguese luthiers Cordoba Guitars and Antonio Pinto Carvalho (in Braga about an hour north of Porto) continue the tradition today. In Porto, you can audition a Portuguese 12-string guitar or a cavaquinho at Toni Das Violas, a music shop in the historic center. Porto is also the official source of Port wine, a special red wine in which the fermentation process is interrupted by the addition of distilled grape spirits known as aguardente (roughly translated as fire water with teeth), leaving a higher sugar and a higher alcohol content. The resulting fortified wine is then aged in wood barrels prior to bottling. Visiting Conímbriga, a well-preserved ancient Roman city and attached museum about an hour south of Porto, is practically like traveling to ancient Rome in the Tardis. Something about Porto seems to inspire artists who work with space. Not only is it the home of Casa da Musica, it’s also the birthplace of two Pritzker-prize-winning architects: Álvaro Siza who designed the central square in Porto, the Faculty of Architecture campus, and the contemporary art museum; and Eduardo Souto Moura whose award-winning work includes Estádio Municipal de Braga, the Burgo Tower in Porto and the Paula Rego Museum in Cascais among others. Presenters: Experts from the fields of music, sound art, sound design, mathematics, philosophy & audio engineering who use Kyma in their work. 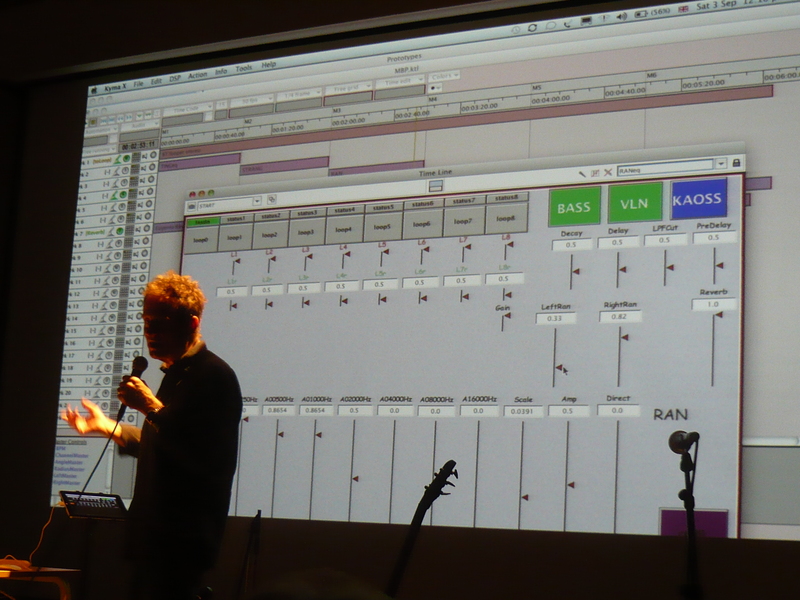 John Paul Jones and Helge Sten presented a Punkt Seminar on 3 September 2011 where they talked about how they are using Kyma in their new project: The Minibus Pimps. Their debut performance was at Punkt and their EU debut will be 16 September 2011 at KISS2011 in Porto, Portugal.